ST. GEORGE – Inspired by the actions of Nevada rancher Cliven Bundy and his stance against federal control of public lands, a rancher on the Arizona Strip has also declared the Bureau of Land Management to be an illegitimate agency and said he will no longer comply with or recognize it. “I hereby cancel all my contracts with the BLM,” LaVoy Finicum, of Cane Beds, Arizona, wrote in a letter he sent to the U.S. Solicitor General following his decision to no longer acknowledge BLM or its policies. Thus far, he has chosen to discontinue paying grazing permit fees and to ignore when the BLM allows certain allotments – or pasture areas – to be used for grazing. Unlike Bundy, who has had a strained relationship with the BLM and similar federal agencies for over 20 years now, Finicum’s relationship with the local BLM has been largely positive and civil. So what happened to change Finicum’s mind concerning the BLM and it’s oversight of public lands? It was his time with the Bundys during last year’s standoff, Finicum said, adding he was one of the cowboys who rode with the Bundy family and their supporters down into the wash under Interstate 15 where federal agents had taken many the Nevada rancher’s cattle. Read more about the Bundy-BLM standoff here. In short, the Arizona rancher’s own actions were inconsistent with his beliefs, he said, so he decided to follow in Bundy’s footsteps. “We actually enjoyed a really good, professional working relationship with Mr. Finicum right up until Aug. 4,” said Rachel Carnahan, public affairs specialist with the BLM’s Arizona Strip District Field Office. At that time the BLM became aware that Finicum had run some cattle onto a grazing allotment before his “season of use,” Carnahan said. The BLM restricts when cattle can graze on an allotment, she said, in order to give the land a chance to rest and recover. “Our mission and focus is the long-term health and productivity of that land,” she said. Finicum contends that the federal government – and the BLM by extension – has no right under the Constitution to regulate use of public lands. The BLM contacted Finicum by phone soon after it learned of his alleged trespass on the grazing allotment and, Carnahan said, it subsequently mailed him a notice of trespass. “We’re treating this as a routine administrative trespass,” Carnahan said. Finicum, who bought the grazing rights to the allotment in 2009, said he hasn’t run any cattle on that pasture due to a lack of water in the reservoir on the estimated 4,000-acre parcel. Prior to August, when he discovered there was water there for his cattle, he took advantage of the situation. “These grazing rights are private property rights,” Finicum said, and as such, as natural rights, they are protected under the Constitution. Natural rights are defined as those rights that cannot be granted or restricted by written law. An example used to illustrate the concept of such rights are those listed in the Declaration of Independence – life, liberty and the pursuit of happiness. Such rights must be continually used and defended in order to be maintained, Finicum said. However, through the Taylor Grazing Act, the federal government has usurped those rights as far as grazing is concerned, he said. As for the fees Finicum said he will no longer pay to the to BLM, he has approached Mohave County officials about setting up a system whereby he could pay a production tax directly to the county. Unlike the BLM, the rancher said, he fully acknowledges county and state authority over the land. Read more about ranchers’ worries about the proposed Grand Canyon Watershed Monument here. With the stance Finicum is taking with the federal government, a question arises as to how far he is willing to go. Will things largely remain civil between him and the agencies involved? Or will things spiral in the direction of potential conflict as they did in Clark County, Nevada? As the standoff between federal agents and Bundy resulted after 20 years of defiance by the Nevada rancher, it may very well be too early to tell what will happen in Finicum’s case. Others are hoping everything remains civil. For now, as Carnahan said, the BLM is treating this as a routine trespass situation. A notice of trespass has been sent, though thus far Finicum has not responded to to it, she said. The BLM has met with various county officials about the matter, including Mohave County Sheriff Jim McCabe, Carnahan said. A claim often raised by opponents and critics of the BLM, Finicum included, is that it is led by individuals appointed by the federal government who are thereby not accountable to the people as elected officials would be. Therefore, they cannot be easily removed from power as an elected official could be by a recall or losing an election. The BLM does not agree with that assessment. “BLM certainly, definitely does answer to the American people,” Carnahan said. What demonstrates the accountability of the BLM to the people is the routine and regular meetings it has with federal, state and local agencies and elected officials, she said. “The people through elected officials and through these agencies help us with the checks and balances on how the land is managed,” Carnahan said, adding that state and local constituencies are represented through those elected officials and local agencies with whom they meet. 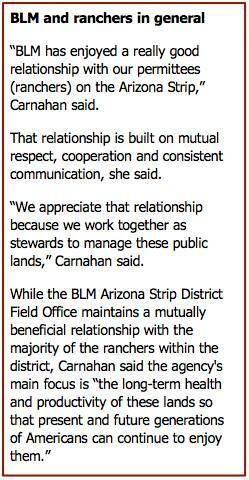 “We answer to the American public, to the American people, absolutely,” Carnahan said of the BLM. Ed. Note: The video attached to this story refers to the BLM sending Finicum a notice of trespass “earlier this month,” that month was October. Mr. Finicum’s “…stance against federal control of public lands” is a classic oxymoron although I doubt he understands it that way. If they are public lands owned by the Federal government, then who else could represent the public in controlling them? These folks may not like the rules and regulations but openly defying them is asking for judicial action. We are a nation of laws; taking the law into one’s own hands is unconstitutional. BIG GUY, Funny how you can’t see how so many departments of federal bureaucracies are violating our constitutional rights. There are many examples in the bureau of education, treasury, and others over the last century. I recommend you read and understand the US Constitution! If all these “constitutional rights” are being violated as you say, surely various conservative groups would be suing for relief in court. It is easy to find a judge and appeals court who would find these violations and the case would end up in the Supreme Court. Please give some specific examples of your constitutional rights violation claims and tell us who has taken the Feds to court. Without specifics, your statement is only your opinion just as Finicum’s claims are. I beg to differ with you Big Guy we are not a nation of fair, just, equitable laws any more. We are run by self serving international elitists who are stealing and controlling every thing they can get their grubby hands on. They are sociopaths . No laws or rules apply to them. The laws only apply to us peasants. We better not get caught hunting in King John’s forest. Whether it is the bankers or corrupt congressman or secret service perverts; they all get away with anything they want to. I do not accept or respect that. The federal government should not “own” and “control” every thing. I am being polite when I say again loudly ” go away feds and international elitists” Others are saying it differently but it is the same message- GO AWAY!!! Native when you say “…. We are run by self serving international elitists who are stealing and controlling every thing they can get their grubby hands on. They are sociopaths . No laws or rules apply to them. The laws only apply to us peasants”, are you referring to Mormons, Republicans or both? Who brought up Mormons or Republicans ??? Oh I know!! you did Rainbow. You just can’t get over your own narrow, small minded thinking can you? Every other post from you is trash Mormons, trash Mormons, trash Mormons. Do you ever think about anything else? What a bitter, Unpleasant person you must be to be around. I have people and things I don’t like but hopefully I can learn from your bad example and not look for every and any opportunity to be a nasty back biter. “I live in America. I have the right to write whatever I want. And it’s equaled by another right just as powerful: the right not to read it. Freedom of speech includes the freedom to offend people”. Here we go again with the Native’s conspiracy theories– Woe is me! The evil government and “international elitists” are responsible for my pitiful life. Yeah. kind of makes you wonder who was really standing on the grassy knoll. And BTW environmental groups sue like theres not tomorrow . Do you agree that the Constitution is the supreme law of the land, and that the Federal Government is bound to obey it? If so, please show me which enumerated power grants the Federal Government the authority to regulate land grazing rights, much less OWN land at all. Why do so many “conservative” or “independent” or Republican types like these ranchers (Bundy and Finicum) see how important our constitutional rights are when it comes to property rights and gun rights BUT NOT when it comes to personal liberties: the “war on drugs”, USA Patriot Act, government regulations on “morality”, taxpayers funding faith-based charities, and military adventurism (policing the world by occupying nations around the world! = billions of taxpayer $$$$)? You need to be consistent in fighting for ALL human rights! Once you learn how to do that, you will gain more respect from more Americans. Making a list of what either you or Finicum think are “rights” doesn’t create them under law. I took him to task for assuming a “right” that doesn’t exist. As for the”rights” you list above, only several personal “morality” liberties have been changed on constitutional grounds and those amid great and continuing controversy. You may believe strongly that the others are wrong, but that doesn’t create a violation of a constitutional right. Finicum’s conservative views and your liberal views are just that: views that are inconsistent with each other. Serious constitutional issues will find their way into the courts where “views” will be adjudicated and rights defined. Don’t not forget the “Western Freedom Festival”. Recently Republicans in Congress were up in arms about funding PBS and Planned Parenthood claiming they are unnecessary expenditures but fully back the expenditures that result in things like F35 Jets, Obamacare revotes, benghazi investigations, putting a man in prison for life because he smoked some pot (That alone costs the state $27,000 per inmate per year). OH you want to fund an organizations who is in the business of SELLING BABY BODY PARTS? REALLY are you serious?? SICK ..
Good lord the people here posting are some of the most sickening posters i’ve ever seen anywhere, sound like a bunch of communists. So when there is a wildfire on “his” grazing land, or for that matter, any of the grazing land controlled by the BLM, he wont expect the any BLM resources or money to try to put it out. Right? Moocher? No, that is someone like you collecting food on your welfare card while we pay your bills. Ranchers may be stingy but moochers, not on your insolent life. Moocher? That would be someone like you who worked a government job for your entire career and now collects a government retirement check. How is your mooching any different from that of the welfare recipient? If you consider that local ranchers pay only a small percentage of the market rate for their grazing on federal lands, it is obvious that they are most certainly moochers. Of course, a lifelong moocher like you would not recognize it as such. Traffic in the gorge was unusual today..
People who support Bundy’s and Finicum’s position should study the history of our public lands rather than relying on what the old Sage Brush Rebellion followers and Ken Ivory’s American Lands Council tell them. These ranchers who (or would be if they were paying!) pay $1.35 an AUM to graze should be kicked off OUR public lands and made to seek private grazing (can you spell “free market”?) somewhere else where they would pay about $10 an AUM. Folks, they’re taking all of us for a subsidy ride including the “freedom” crowd who are doing their bidding for them! Funny how wrapping any argument in the Constitution makes it reasonable no matter how really unreasonable it is. It’s OUR land, not his. Furthermore, if it was his land, I’ll bet he couldn’t afford the taxes. If the state got ahold of it, they’d likely sell it, or at least lease it to a gas company, and I’m pretty sure he wouldn’t be grazing it then. Some oil company’s security folks likely aren’t going to cave like the Feds did for Bundy in the event of some manner of standoff. Maybe developers buy it. No grazing. Some environmental group with rich backers and good lawyers might take it. Again, no grazing. I have not heard one actual explanation of why the Feds can’t own and manage land. “Because the Constitution” is not an answer. Where in the Constitution? What wording? Just pay your fees, sir. They’re so cheap, they’re basically a form of public assistance for ranchers, anyway. Has anyone who is complaining about the federal government and its “land grab” ever read the Enabling Act that allowed Utah to become a state? Or have they just listened to what someone (like Ken Ivory of the American Lands Council) says is the intent of the Enabling Act? Personally I would much rather have the federal government in charge of public lands instead of states and counties. We’ve seen too many instances of the “good old boys” doing favors for their buddies right here in Southern Utah. The forced transfer of part of Snow Canyon State Park to The Ledges comes to mind. Our good Washington County leaders “helped” The Ledges expand so the million dollar houses could have a fine view of Snow Canyon to the detriment of the public. Very good point. Having actually read the Enabling Act, I know that these chronic complainers are full of it. What none of them ever mention is that no court of law in this country has ever sided with their ridiculous claims about the Constitution and American jurisprudence. Generally, I agree. However, I have seen a few braless tank tops, in my time, that I wish I could unsee. I suppose his cattle wandering land HE DOESN’T OWN are simply up for grabs.